When PEST implements “SVD-assisted” parameter estimation, it computes the global Jacobian matrix only once. Then it decomposes parameter space into estimable and inestimable parameter combinations. It then reformulates the whole calibration problem so that, from that moment on, it estimates only “super parameters”. Only as many of these are required as there are dimensions in the calibration solution space; alternatively, only as many of these need to be defined as you have computing resources to estimate. Through the use of super parameters you can get all of the benefits of highly parameterized inversion with a comparatively small run time burden. Your model can have hundreds, or even thousands, of parameters, but these may be accommodated with a computational burden of only a few tens of runs per iteration. 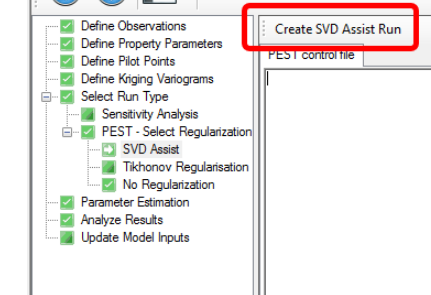 Click on the [Create SVD Assist Run] button on the toolbar, as shown below. The following Settings dialog will appear. For SVD Assist, you must provide the number of Super Parameters to use. Please consult the PEST manual for a recommended set of parameter values. After clicking OK in the settings window, the PEST Control file, customized for an SVD Assist run, will be populated as shown below.